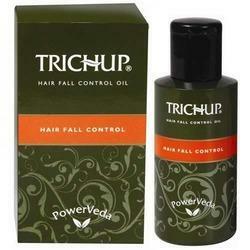 Our offered range of products is inclusive of Trichup Hair Fall Control Oil. It is a non-sticky hair oil which is priced reasonably. Trichup Anti-Dandruff Oil is a shield to your healthy and youthful hair. It efficiently protects from dandruff and also helps remove pollutants that clog your hair roots. This oil contains very well proclaimed Anti-Dandruff herbs of Ayurveda that helps improves scalp health, controls skin exfoliation and allows natural growth of your hair. Shri Ramana Medical Agencies Pvt. Ltd.
We take pleasure to introduce ourselves as one of the renowned firms for providing the best-in-class range of Trichup Hair Fall Control Oil. By keeping track with market advancement, we are occupied in providing optimum quality Trichup Hair Oil. This oil is from free harmful chemical, processed only with the usage of natural herbs and other ingredients. We deals in Karnataka only.